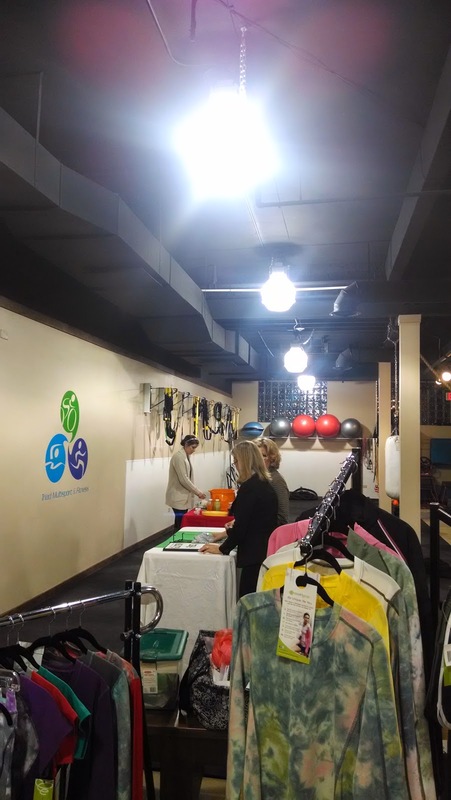 A few weeks ago, Amy invited me to join her to a Ladies' Night Out at the Barrington Running Company. 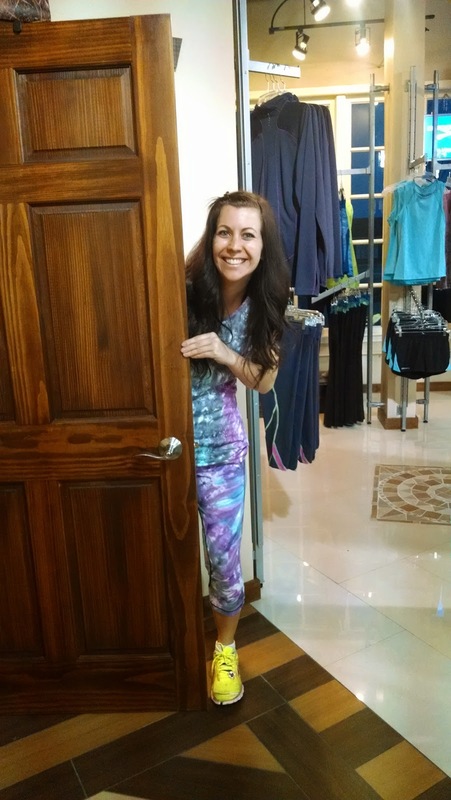 Amy is an ambassador for Swirlgear and has a few really cute pieces from the company so I was excited to check it out. 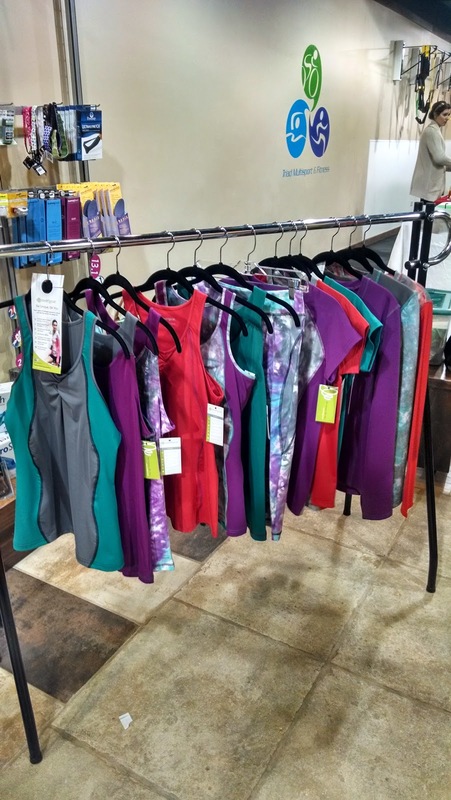 Swirlgear makes women's exercise apparel that is flattering and comes in fun colors. Plus they have a lot of tie-dyed stuff! 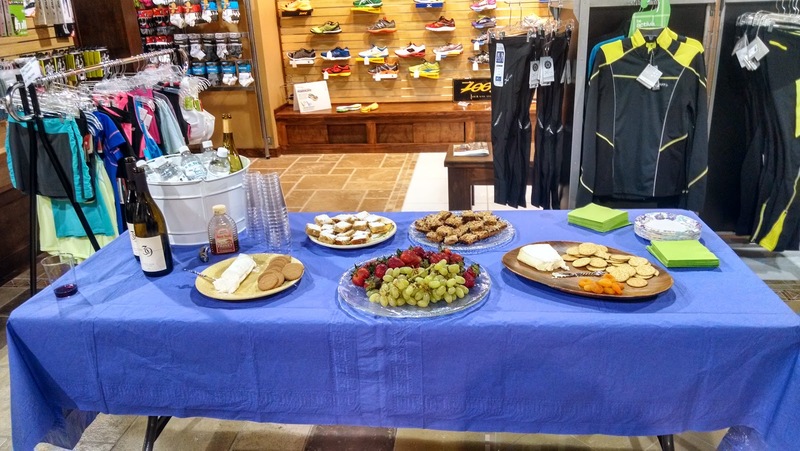 Barrington Running Company recently became a retailer for Swirlgear so this was a little bit of a kick-off party. They had a few other vendors there including a Arbonne rep and a juice rep. Plus there was wine, cheese, fruit, and sweets. I think I ate half the brie that was there. It was so good. Amy and I spent the time chatting about triathlon training and catching up. We also chatted a lot with Marisa from Swirlgear. She told us about the new line of clothing that will be out in May and we talked about running, getting up in the morning to work out, and a lot of other things. 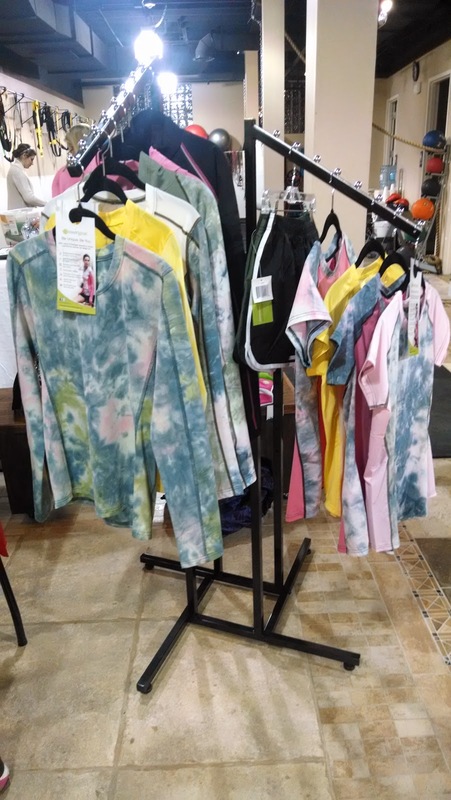 We got the chance to try on a few Swirlgear pieces which I was excited about. I don't buy a lot of clothes online because it makes me nervous that I don't know how they fit. So I was happy to be able to check out the Swirlgear items in person! Check out Amy in her matching top and bottom. Even though I tried to convince her to buy both of these pieces, she decided that it didn't look good together. I also tried on the capris with my dress on. I ended up ordering a pair of these capris for my birthday! They don't come in till May and I was worried that it would be too warm to wear these then, but with the weather we've been having, they will be perfect. One thing I noticed about the Swirlgear is that there items are high quality. The fabric of the capris was thick and didn't feel like it was going to stretch and fall down after three uses. I do think their prices are on the high side of what I normally spend for running gear, but the quality is worth it, if the piece last a long time. Me, Amy, Marisa from Swirlgear and Leanne from Barrington Running Co. It was a great night! Thanks to Amy for inviting me! I was not compensated for this post or attending the event or asked to write about Swirlgear. I just\wanted to spread the word about a great company.